Someone who possesses “magic,” a systematized technological skill. Very few people are suited to wield magic; genetics plays a pivotal role. In Japan, as in other countries, international-grade licenses have been introduced as part of the magician management system. The government is pouring its resources into developing powerful magicians. /accelerating magic sequences, imprinted with the activation code for casting a magic spell. 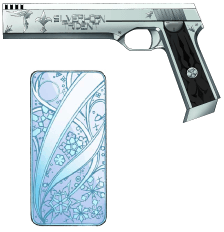 An indispensable tool for the modern magician which has supplanted such traditional methods and tools as incantations and amulets.Widely referred to as “CADs” or simply “devices," they come in all shapes and sizes.There are two main types: the specialized CAD, and the all-purpose CAD. The Magic High School located in Hachioji, Tokyo, popularly known as "First High." An elite institution that, year after year, sends the greatest number of graduates to the Magic University, it is run under a two-tiered system, Course 1 and Course 2. There is a maximum of 200 students per grade, and 25 per class. Course 1 is comprised of Classes A ~ D, whereas Course 2 is comprised of Classes E ~ H.
Slang terms for, respectively, the Course 1 and Course 2 students at First High. An eight-petal emblem adorns the uniforms of only the Course 1 students, and because of this garland design, the Course 1 students came to be known as "Blooms." "Weed" is a derogatory term for the Course 2 students, and as such, is officially banned from use, but a considerable number of students still use it. Non-physical entities, also known as Spirit Particles. Their existence has been confirmed, but their true nature and function remain shrouded in mystery. Although it is still merely a hypothesis, they are thought to be particles that give shape to the emotions produced by intent and thought. Non-physical entities, also known as Thought Particles. Like Pushions, their true nature is yet to be discovered, but the leading hypothesis is that they are particles that give shape to thought and intent. Ordinarily, it is Psions that are used in magic, and modern-day magic emphasizes Psion control. The blueprints for magic spells. Modern-day magicians save these sequences to their CADs in compressed form. When activating a spell, the magician transmits Psions to the CAD to receive an activation sequence, from which a magic sequence is then constructed. Since this involves a vast amount of information, the magician himself can normally only process it semi-automatically within the constraints of his own Magic Calculation Area. An information body constructed from a magician's Psions. When a magic sequence interferes with, and overwrites, an Eidos, it can alter real-world phenomena. However, because of the world's restorative power to maintain temporal continuity, magic sequences cannot be used infinitely. Originally a Greek philosophy term. Under modern-day magic, Eidos refers to the information bodies pertaining to all phenomena. The force of a magic sequence overwriting an Eidos is called "interference strength," and in modern-day magic, this is one area by which one's magical prowess is measured. Originally a Greek philosophy term. Under modern-day magic, "Idea" refers to the platform upon which an Eidos is imprinted. It is, so to speak, a dimension running parallel to the physical dimension which we live, and the Eidos of all phenomena is imprinted on this dimension. The most powerful group of magicians in Japan. Out of twenty-eight families whose surnames all start with a number from one to ten, ten are elected every four years at the Ten Master Clans Selection Conference, and they alone are granted the right to this title. Although they stay strictly behind-the-scenes in terms of politics, with their personal might as leaders of Japan's magicians, they command a considerable number of assets. 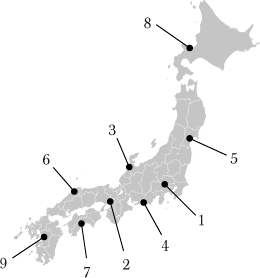 The current Ten Master Clans are the Ichijo, Futatsugi, Mitsuya, Yotsuba, Itsuwa, Mutsuzuka, Saegusa, Yatsushiro, Kudo, and Jumonji families. Most notably, the Saegusa family, which has produced numerous magicians of remarkable skill, and the Yotsuba family, whose leader is seen as the most powerful magician in the world, are regarded as the two most influential of the Ten Master Clans. Coincidentally, each of the numbers between one and ten are represented in the current lineup – something which has never before happened since this hierarchy was established. A slang term referring to families known for their hereditary talent as magicians, whose surnames include a number. This includes the twenty-eight families eligible to call themselves one of the Ten Master Clans, and the “Hundred Families” bearing a number higher than eleven in their surnames. Although a higher or lower number doesn't in any way indicate how strong or weak one is, it is still a means to gauge his or her skill as a magician, as lineage means everything. At First High School, Mayumi Saegusa and Katsuto Jumonji are well-known as members of the Ten Master Clans, but the school is also home to members of the Hundred Families - Isori, Chiyoda, and Chiba. OOParts with magical properties. Unlike the original meaning of the term - “an object made with technology exceeding the era in which it was unearthed” - it refers to magical objects that cannot be reproduced by modern science; Antinite, which probably couldn’t have been created naturally, is also known as a Relic. Needless to say, it is difficult to replicate, and thus far no one has succeeded. Official name: National High School Magic Thesis Competition. Held once a year by the Magic Association, on the last Sunday of October. The venue alternates between Kyoto and Yokohama. Just as its name implies, it is open to high school students around the nation, but since magic high schools are the only institutions authorized to teach Magic Theory, it is similar to the Nine Schools Competition, contested between the nine magic high schools. Each school calls for applicants, and the most talented groups are chosen to represent them. Each group is comprised of one primary author and two co-authors, for a total of three members. The schools throw their full support behind their representatives, helping with the manufacture of demo devices and supplying security. Despite being the work of students, they are of a high level, and so the Magic Universities and private research institutions are always keenly interested. A.K.A. GAA. A massive nation comprised of early 21st century China, northern Burma, northern Vietnam, northern Laos, and the Korean Peninsula. Until the mid-21st century, hostilities brewed between the GAA and Dahan in the southern half of China, but when Dahan suddenly suffered an internal breakdown in 2064, it was absorbed into the GAA, turning the latter into an expansive state. In 2092, the GAA sent combat forces and spies into neighboring Japan - the Okinawa Invasion - but since then, no cease-fire has been agreed upon, let alone a peace treaty, and tension remains between the two sides. The 101 Independent Magic-equipped Battalion. Led by Harunobu Kazama. Because this experimental unit conducts test runs of newly-developed equipment, it is shrouded in absolute secrecy. Although it is a battalion, its actual size is about that of two mid-sized companies. It is comprised mainly of magicians with various specialties and unique personalities. Another striking feature of this unit is that there is a greater ratio of Ancient Magic users than in other squads. Tatsuya is a member of this battalion under the name Ryuuya Ooguro.